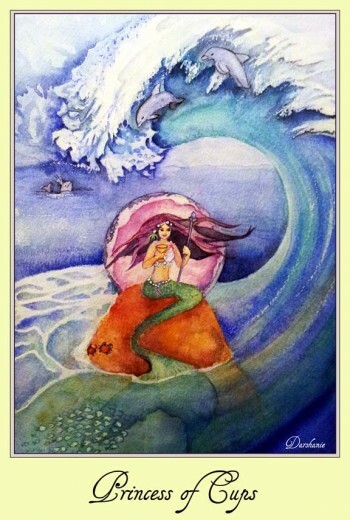 The Princess of Cups finds her home in the ocean, the vast free flowing realm of emotions. She is a very sensitive person with a wide emotional range. She can reach heights of ecstatic joy and fall to the deepest caverns of despair. She is connected and aware of her own feelings and can easily recognize them in others. She is highly empathic. This makes her understanding, sympathetic and caring. At the same time she picks up unspoken negativity and is easily hurt. Her world of feeling that is easy to get lost in. The Princess of Cups is young and still learning how to manage this open realm. She is playful and imaginative and loves to spend much time in her fantasy world which is for her a place of real experiences. She finds great connection with music, dance, art and poetry. They speak her language of emotion. She understands the infinite nuances of a smile and the various moods within a single color. She feels the celebration in the sky when the sun rises and the charge in the water when the moon takes over at night. She does not need words to communicate as everything speaks to her directly through their very presence. Her world is intense, expansive and unspoken. We all have a connection to this place. It is instinctual and written in every cell. There is a rhythm within every human that leads back to this energy. To experience the Princess of Cups, spend some time alone and move into silence. Feel the rise and fall of your breath mimicking the rise and fall of the ocean waves. Let your boundaries dissolve as you move into a space of water. Feel your thoughts; try to feel what is behind the expression of your words before they form. Let your mind melt into liquid. This is your ocean, your inner world without parameters. Try experiencing it without the use of words. This can be overwhelming and even scary. It’s a big world to open. The Princess of Cups knows this realm well and is learning about herself through this channel. The Princess of Cups is one of the 16 court cards in the tarot deck. The court cards describe personality types that we need to look at. It might indicate qualities that we are in the process of developing and also people in our lives that embody those traits. 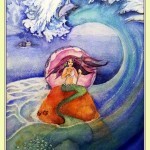 The Princess of Cups is a young mermaid sitting comfortably in the midst of a powerful ocean scene. Her tail carries her consciousness far down into the underworlds and fans out into the subconscious. She is an agile creature in the watery realm of emotions but a bit clumsy on land and practical matters. There is a huge swell behind her representing huge surges of emotion. Dolphins and whales embody the playful and mystical heights of her emotions. The fishes swimming at her tail represent her empathic ability to connect. When you get this card take time to feel. Music, art, poetry and play might be good ways to do so. Look to see if there is someone in your life that this card might be pointing to. There is something new at the feeling level that wants exploration. Self-discovery and self-acceptance want to take place through the feelings that are surfacing.